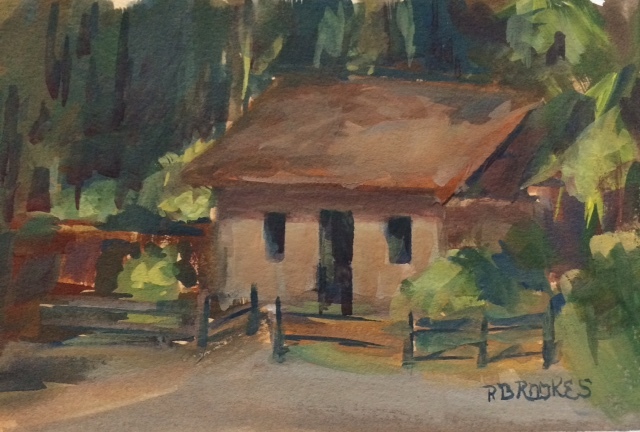 Pat Brookes: Gouache, can you pronounce it? Gouache, can you pronounce it? When painting a watercolor, one values using the white of the paper, or going from light to darker. Gouache is sneaky and it takes lots of gray before you find the value needed to make the painting speak. I monitored a class last week at WIFAS, instructor was Mike Hernandez, Artist, instructor, Plein Air painter, Art Director, Production designer DreamWorks Pictures. I’d like to add patient, relaxed instructor who also paints beautifully in oil and on the computer. You can find Mike on Facebook and see some of his beautiful paintings. We painted small 5x7 and 4x5 on special board by Cottonwood Arts, or in my case Canson board. Its and acid free cardboard-like surface that can be popped into a mat easily. Mike recommends not putting these paintings under glass. The images are low key; a gray day is celebrated for its moody effects. Today, I plan on trying to paint a little brighter. 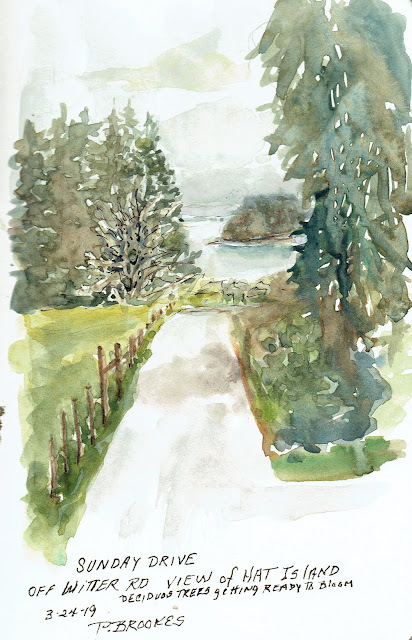 Here are a few images from last weekend and yesterday, painting on the cliff across from Camano Island in the mist. From Sea Wall park Langley looking Northwest?